If you want to have that quirky MINI style but with more room and versatility, then our range of used MINI Pacemans are for you. 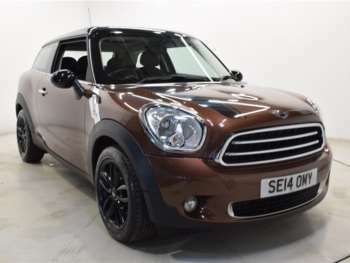 The MINI Paceman is on the larger end of the MINI scale and boasts plenty of room on the inside and plenty of style on the outside. This high-class car is comfortable and offers a good driving experience for both drivers and passengers. It goes without saying that when you get one of our used MINI Pacemans for sale, you’ll be getting a car that is all about style. The quirky and chunky front end is recognisable as a traditional British motoring style and will make you proud to own a MINI. You can also expect room in the back, especially compared to other models in this brand. MINI also offers good reliability too, so you can feel confident when you buy. Just like the rest of the MINI family, a used MINI Paceman offers competent handling and handles pretty much everything, well. The Pacemen also comes with sports suspension and a lower ride height, but if the result is too frim for you, the more comfortable standard MINI suspension is available as a free option. Also, the MINI Cooper diesel is a winner for fuel economy. Explore our range of used MINI Pacemans today, to find your next favourite car! Got a specific MINI Paceman model in mind?